The inspiration for the popular sweet, marsh mallow is now used mainly for its medicinal benefits and as an ornamental plant. The history of marsh mallow stretches back to the biblical Book of Job, where its use is briefly but clearly mentioned. Though it originated in Africa, it was domesticated in Asia and Europe before records began. Its natural habitat consists of temperate regions. 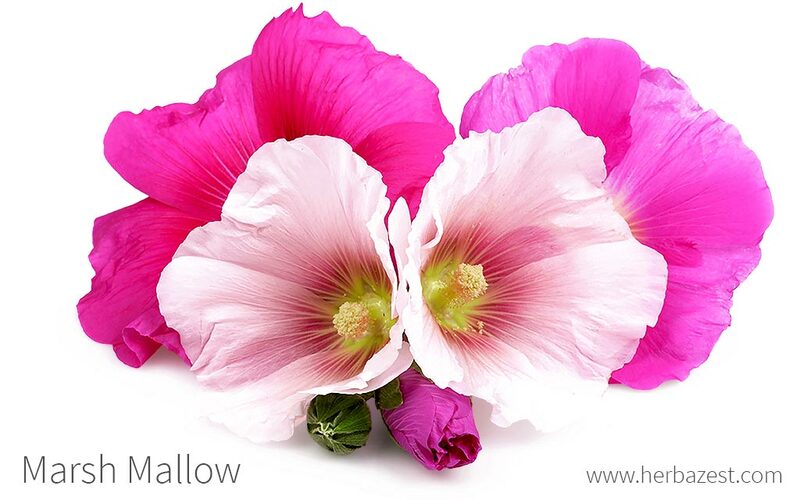 Marsh mallow has been used for medicinal purposes since the times of Theophrastus (ca. 300 BCE) in Ancient Greece, where it was thought to be effective for fighting coughs. In the European Middle Ages, herbalists used marsh mallow to treat a range of ailments, and by the mid 19th century, it was included in the U.S. pharmacopeia. Relieving symptoms of GERD. Mucilage acts as a protective layer over inflamed areas, providing relief from peptic ulcers and GERD. Lowering skin inflammation. Marsh mallow's anti-inflammatory action stems mostly from mucilage, which acts as a protective layer over inflamed tissue, allowing it time to repair. Treating wounds and skin lacerations. When mixed with water, mucilage can act as a bandage. The value of marsh mallow comes primarily from its mucilage content, a thick substance that coats membranes. The plant contains other beneficial polysaccharides, including rhamnogalacturonan, which can help suppress coughing. Marshmallow root extract has flavonoids, which accounts for its anti-inflammatory properties. Marsh mallow is generally regarded as safe, though it may interact with some conditions and medications. Preliminary evidence shows that marsh mallow may lower blood sugar levels, so diabetic patients should consult their healthcare provider before taking the herb. It may amplify the effects of lithium and diabetes medications, so it should not be taken alongside these drugs. Marsh mallow remedies are typically made from the root, though the leaves are sometimes used as well. The root contains about 11% mucilage, the soothing polysaccharide in this herb. Infusion. Several cups of marsh mallow tea can be consumed daily for soothing sore throat or upset stomach. Tincture. The typical dose for consuming marsh mallow tinctures is 30 - 40 drops in one glass of water. Syrup. Some commercial cough syrup preparations contain marsh mallow root extract. Cream. Marsh mallow creams and ointments are topical preparations that can be applied to the skin to soothe inflammation. It also has an antibiotic effect against Gram-positive bacteria, making in potentially helpful in wound healing. Capsules. The daily dose of marsh mallow in capsule form should not exceed the equivalent of six grams of powdered root. Ground marsh mallow and prepared marsh mallow teabags can be found in health stores throughout the world. They can both also be purchased from online retailers. Ground marsh mallow can also be mixed with boiling water in order to make an infusion. Marsh mallow supplements are mainly found in specialized health stores. There is also a wide variety of marsh mallow supplement choices available through online retailers. These supplements are typically made from powdered root of marsh mallow, and they may also include powdered leaves. Marsh mallow is a hardy, very adaptable herb that can grow in nearly every climate condition and soil. However, in order to cultivate it in a garden, it is necessary to meet certain conditions for optimal growth. Marsh mallow grows best in fertile, moisturized soil, though dry soil conditions can also be tolerated. Full exposure to sunlight is recommendable for healthy growth. Marsh mallow can withstand temperatures up to 77°F (25°C). Seeds should be planted 18 - 24 inches (45 - 60 cm) apart and should not be over-watered. The marsh mallow plant grows to an average 3 - 4 feet (0.9 - 1.2 m) high, but can reach up to 6.5 (2 m) tall. Its silky, five-petaled flowers are pale pink with darker pink stamens in the center. Marsh mallow is a member of the Malvaceae family, also known as the mallow family, which contains 2,300 species spread over 200 genera. This family contains some economically important and well-known herbs, including hibiscus, hollyhock, mallow, cola nut, and cacao. No true varieties or subspecies of Althaea officinalis have been identified. The common mallow (Malva sylvestris) is often referred to as "marsh mallow," but the true marsh mallow is distinguishable from the common mallow. The main difference is that marsh mallow has numerous divisions in the outer calyx and a hoary down that thickly clothes the stems and leaves. It also has lighter-colored blossoms. Since biblical times, marsh mallow has been valued by many different cultures for its nutritional value. Marsh mallow was once widely used in the culinary world, having been the inspiration for the sweet marshmallows that are still popular today. However, since it is no longer used in confectionery, all alimentary uses have all but disappeared, aside from when it is taken as a herbal tea or supplement. The marsh mallow previously held a great deal of economic importance when it was used to make marshmallow candy. However, its namesake no longer uses the herb as an ingredient, so its culinary importance is limited once again. Its most important economic use is as an ornamental herb, due to its intense coloring; however, it is still used in some herbal remedies.